They are a domesticated breed of goat that is descended from West African goats. Not found in the wild. They are descended from wild goats. The Dwarf Nigerian Goat is a small dairy goat with short hair that comes in a variety of colors and patterns. Males and females of this breed can either be born with horns or without horns. The Dwarf Nigerian Goats at the Zoo eat hay, grain and browse (leaves from bushes and trees). 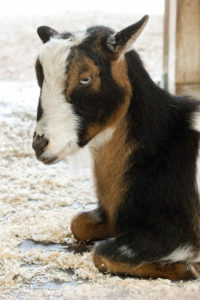 Dwarf Nigerian Goats can breed year round. Does can be bred at 7-8 months of age and bucks can be bred around 3 months of age. Their gestation period is 145-153 days. It is common for a Dwarf Nigerian Goat to have 3-4 kids at a time. Dwarf Nigerian Goats are a heritage breed of goat. Heritage breeds of livestock and poultry are rare breeds of animals that have been raised by people for many years and have a deep history in the United States. Not Evaluated. They are considered rare by the American Livestock Breeds Conservancy. A doe can produce up to 2 quarts of milk a day or more. This milk is higher in butterfat and protein than the milk produced by most other dairy breeds. These animals are browsers. This means they like to eat the leaves off of high growing plants, like trees and shrubs. These animals will also eat poison ivy and poison oak. These animals are highly social and like to live in herds.